Ivan’s feelings about human beings are complicated. On one hand, humans destroyed his family and carried him far from home. On the other, he enjoyed his childhood in Mack’s house, raised more or less like a human son. And while he’s not sure he remembers how to behave like a wild gorilla, his domain at Mack’s mall is reasonably comfortable. He even has his own TV. Stella, Mack’s elephant, remembers more about life before, and understands more about the life she and Ivan are living now. When Mack brings in Ruby, a baby elephant, in an attempt to revive his failing mall, Stella is horrified. And Ivan? He discovers that Mack’s “domains” start to look an awful lot like cages once a child is closed inside. 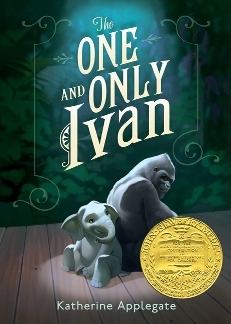 I loved Ivan. His voice is straightforward, insightful, and occasionally witty, without ever feeling affected. I liked Stella’s gravity and Bob the stray dog’s attitude, and I was impressed by the open exploration of the complex relationship between the human and the animal world. That said, it took some time for this book to settle for me. I liked it, but it’s a quick read, and I reached the end feeling like it hadn’t quite accomplished what I’d anticipated — I didn’t feel entirely satisfied. I think, though, that this is a book that deserves contemplation. Applegate’s few words sketch an image with the potential to linger in the memory and challenge the reader in more ways than one, if it’s given the space to do so. So here’s what I suggest: read the story once for the characters. They’re wonderful. Then sit with it awhile and, if you can, read it again. Then come and tell me what you think. Read other reviews from Steph the Bookworm and School Library Journal. This entry was posted in Reviews: Middle Grade Books and tagged animals, awards and honours, friendship, illustrated, moral ambiguity, poetry. Bookmark the permalink.